Joy is a powerful state of mind. It is also a choice. 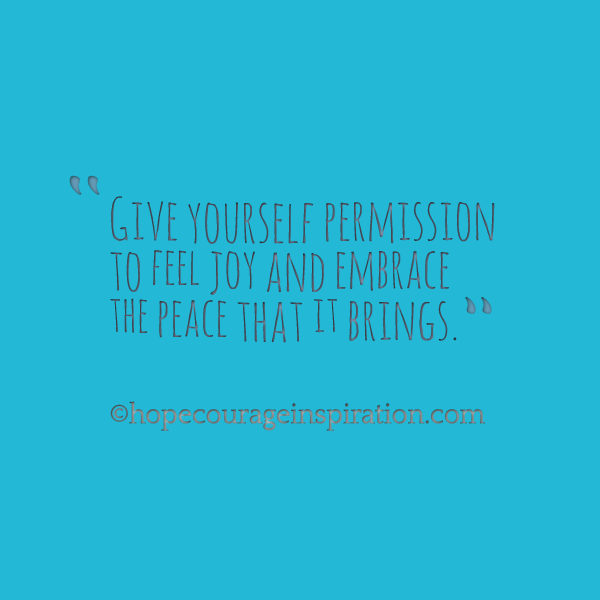 Give yourself permission to feel joy and embrace the peace that it brings. Too often, we spend our lives waiting and watching for joy, convincing ourselves that it’s just around *this* corner or *that* obstacle, when it’s really been walking with us all along. All we need to do is simply invite it inside and make the choice to let it stay awhile. Joy helps weather the storms of life; it is powerful body armor for your mindset. Purposeful, intentional joy cushions the blows of the world and it is a well of strength for your soul; it enables you to see the blessings hidden within the trials you face. Take this opportunity to feel joy softly touch you; think on the things that are going positively in your life. In doing so, you seize the power to propel forward, despite life’s struggles and storms. Allow joy to rise in your life today, replenish your well of hope and strength with it and consciously choose to invite it into your life each and every day.